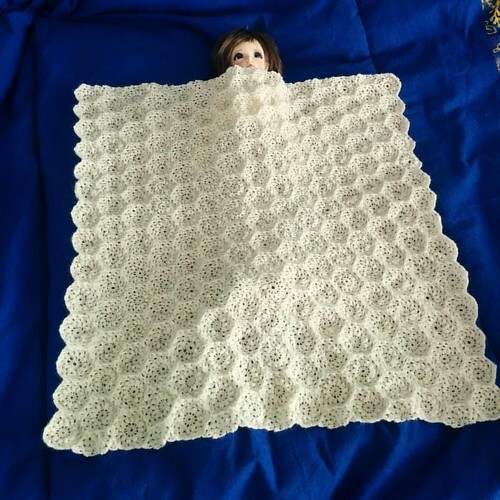 You are currently browsing all posts tagged with 'doll blanket'. decided i would post this every time i finish a row. 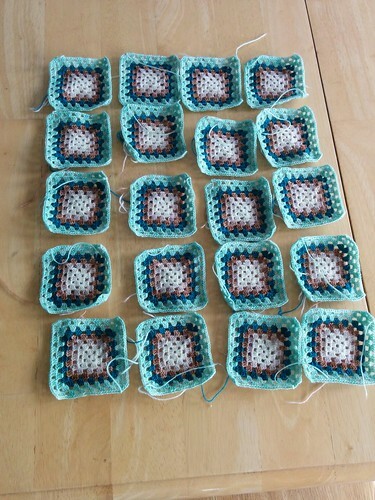 that means it will be pretty often at the start, not so fast as the rows get longer..
got the border finished. now time to soak it and block it flat. 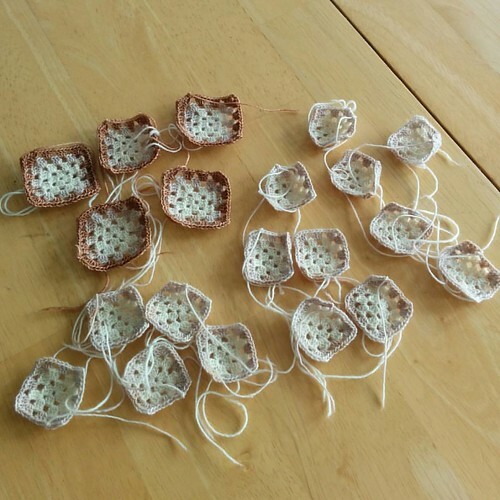 i tried out my new blocking wires. 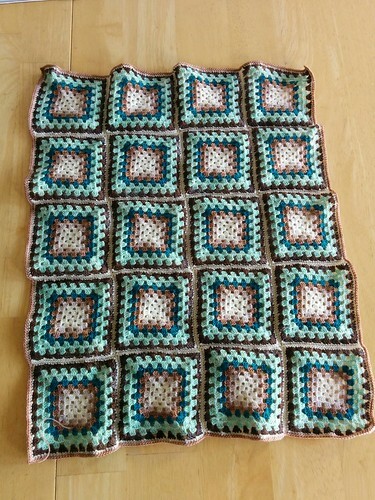 once i threaded it through the edges and figured out how to pin it, i was impressed with how easy it is to block straight and square. went to publish this post and found out someone had hacked my blog and replaced my posts with a bunch of yucky pictures. i almost cried. luckily my husband was able to delete it all and use the backup to get my posts back. if you happened to come here while the x-rated stuff was up, you have my sincerest apologies and hopefully we have got it fixed so they can’t come back! working on the borders now. a good border ties all the colors together and is like a frame for the main picture. 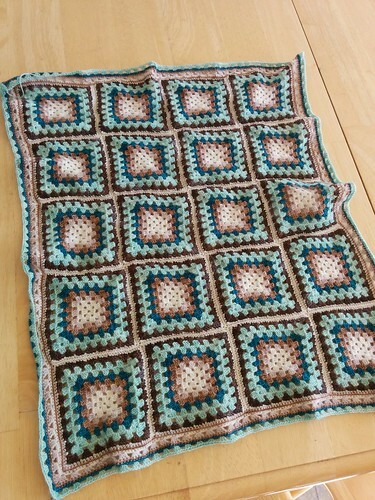 this afghan seemed to require a more elaborate “frame” than just a simple sc border. 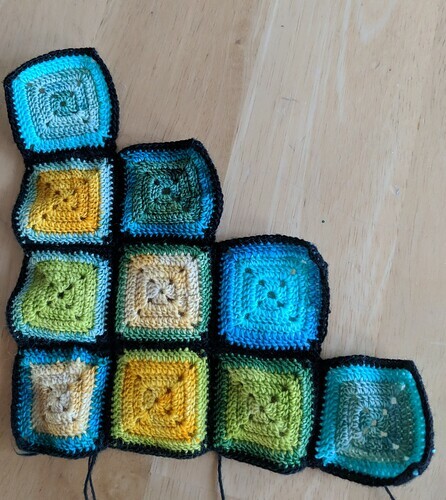 i’m liking it so far, though my need for a good blocking becomes more evident the further i get. i added two colors for the ocean, teal feathers and water green for the water and foam as the waves hit the shore. i’m not trying to make a realistic picture here, just using colors that remind me of that long ago beach, so i’m putting them in the order that i like best and think are most appealing. some of my favorite childhood memories are of visits to my grandmothers house each summer. she lived in vancouver and i loved how green everything was there compared to my prairie home. she also lived within walking distance of the ocean and we spent many days playing in the sand and surf. so when meg asked for a new summery afghan to go in their wicker swing, i had to make something that was reminiscent of those carefree days. 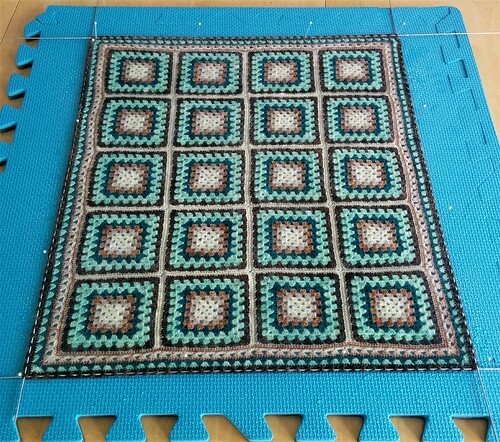 i’ll save the garden theme for another day but here is the start of my ocean dreams throw.